With Halloween just around the corner it’s about time I got in on the horror film blogging action, which tends to take place throughout October. And what better horror film to review than Stanley Kubrick’s classic The Shining. As part of their Premium Collection, Warner Bros. have released the film on Blu-Ray, DVD and digital HD/UV in its original US theatrical form. 25 minutes were cut from the film when it was released in the UK (for time rather than censorship, so gorehounds out there needn’t get excited) and we’ve been watching the truncated version ever since. Back in 2012, the BFI released the US cut in selected cinemas, but it’s not until now that it’s been available for home entertainment. To make the release extra special, they’ve also included plenty of special features too and I’ll talk about those at the end of the review as per usual. 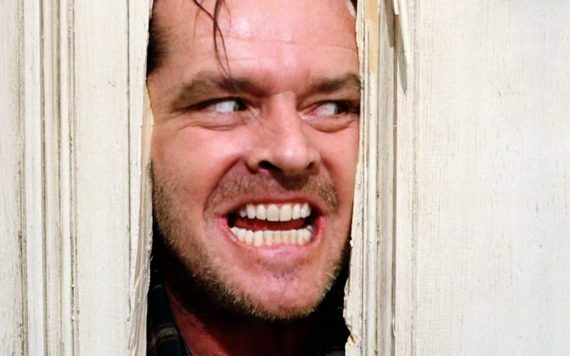 Now, if you haven’t seen The Shining what the hell’s wrong with you? 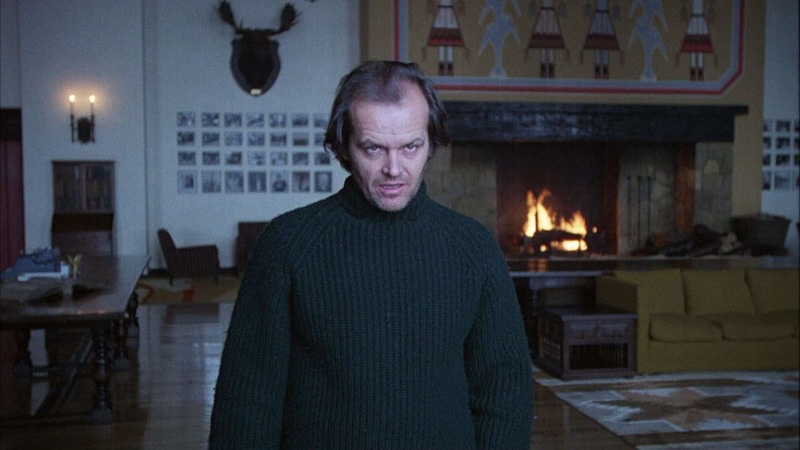 Sorry, I mean, the story (based on a novel by Stephen King) sees Jack Torrance (Jack Nicholson) get a job as the caretaker of a remote mountain hotel whilst it’s closed for the winter. He brings his wife Wendy (Shelley Duvall) and young son Danny (Danny Lloyd) and the three of them stay in the vast building, all alone. Jack sees this as a chance to work on a writing project, but the isolation, existing family problems and possible evil spirits living in the hotel prove too much and he gradually goes insane, threatening the safety and lives of his family. I remember when I first saw The Shining, back on VHS (taped off TV) with my brother and friend. It scared us so much we had to pause it and finish watching at a later date. It had a huge impact on me and has long been a favourite horror film of mine. Over the years I’ve watched it several more times and I must say I don’t find it as frightening as I used to, but I still love the film. That’s not to say it’s perfect though and I can understand why the film has its critics (it didn’t get particularly well received on its initial release). The more I watch it, the more over the top the film feels – everything is laid on pretty thick, from the performances to the music but that’s all part of what makes the film feel so unique and interesting to me. It also helps the film’s finale feel all the more intense as the build up to it is so long and brash. Some elements do verge on the ridiculous and last time I saw it I found it more darkly humorous then I remember. I felt that less this time around though, which goes to show it’s the sort of film you can take something different away from every time you see it. Part of this is also down to the number of cryptic, unanswered questions thrown into the mix. There are lots of suggested mysteries and warning signs at the beginning, from the hotel being built on an Indian burial ground, to a previous caretaker going mad and killing his family, to Jack’s history of alcoholism and violence, to Danny’s unusual psychic abilities and early nightmarish visions. Some of these are further developed, but a couple aren’t and the ghosts and other apparitions in the hotel don’t follow any clear ‘rules’ in terms of who can see them and what they can physically change in the living world. The puzzling final shot only adds to the uncertainty, which may frustrate those looking for a straightforward horror story, but adds to the effect in my opinion. Slow and deliberate dialogue and lots of long dissolves also give a dreamlike quality from the offset, making for a film that never quite seems ‘real’. What has always stood out front and centre in The Shining are the visuals. The film is packed with memorable imagery, from the gallons of blood gushing out of the elevator to the shock appearances of the ghosts of two young girls murdered in the hotel several years prior. What makes the film look extra special though is its heavy use of the steadicam. A brand new piece of kit at the time, it had only been used on a few films previously and this was the first to use it through the vast majority of the running time. 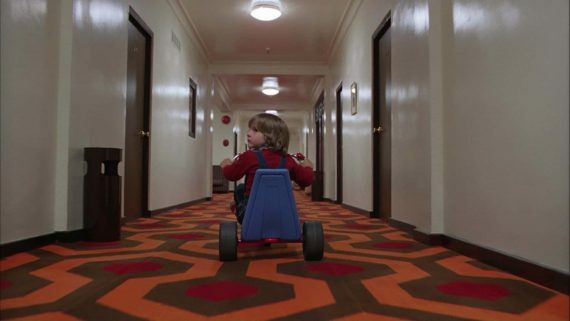 From the famous tracking shots following Danny on his tricycle (made extra effective through the sound of it shifting from hard wood to rugs and back again) to the frantic chase through the maze at the end, the ever floating eye of the camera adds to the dreamlike quality mentioned earlier and provides another looming presence to impose on the characters. Although it’s very in-your-face, I love the music too, which is partly composed, but largely made up of selections of disturbing atonal modern compositions. It creates an overwhelming sense of unease and a constantly threatening atmosphere. 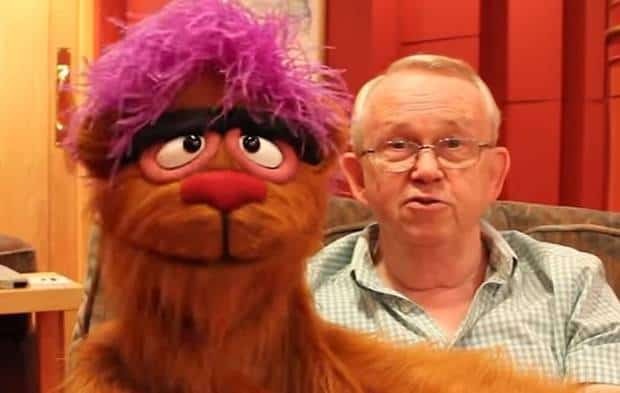 The performances are better than I remembered. I always enjoyed Nicholson’s crazed turn – it’s one of his best, even if it’s not particularly subtle. I used to not be a fan of Duvall though, finding her a bit too much of an arm-flailing wet lettuce. However, this most recent viewing helped me see her strengths, particularly in the earlier scenes where her frailty is less obvious but ever present as she tries to remain the bright spark in an already shaky marriage. Her terrified reactions are also part of what makes the classic “Here’s Johnny” sequence so powerful. Danny is very good for his age too. Some of his shock reactions are a bit comical, but elsewhere he strikes a nice balance of creepy and naturally innocent. It has to be a 5 star film for me, despite any flaws I might find over the years. I can’t think of another film quite like it. It’s largely driven by atmosphere, but there are enough unanswered questions and strange quirks to create an experience I love to dive into whenever I get the chance. It’s a long film, particularly in this extended form which adds a number of quieter scenes between the family to help provide more emotional weight. However, the length never bothered me. I would gladly watch another hour of it if I could. It’s big and bold in the best possible way, distilling horror into its core elements then gracefully, masterfully cooks them up to boiling point for one of the most memorable finales of all time. 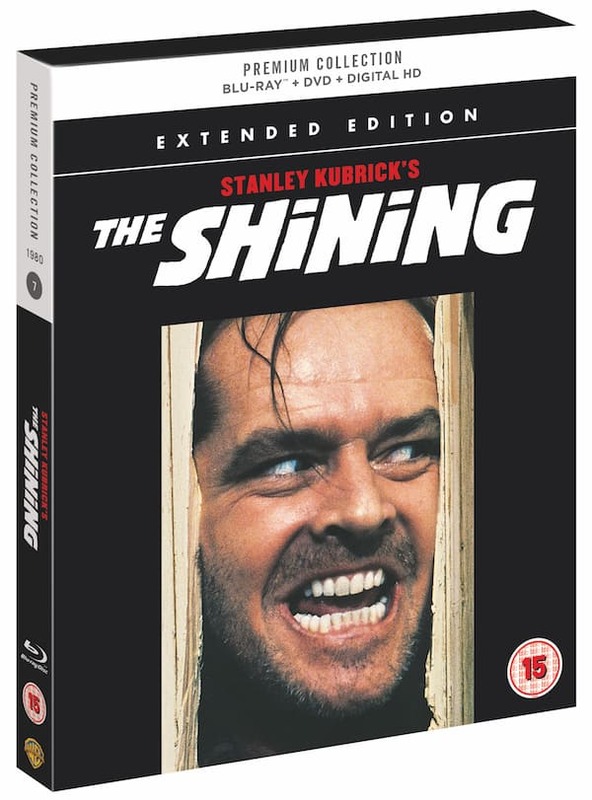 The Shining has been re-released by Warner Bros. Home Entertainment in a Blu-Ray, DVD & Digital HD/UV package as part of their new Premium Collection, sold exclusively at HMV. I saw the Blu-Ray version and the picture and sound quality are both first rate. It’s a fantastic selection of features which are genuinely fascinating to watch due to the difficulty of the shoot. Kubrick, ever the perfectionist, pushed his actors to their limits, insisting on ridiculous numbers of takes (sometimes well over 100) to get exactly what he wanted and treated Duvall like dirt to try and make her feel like her downtrodden and harassed character. The commentary gives a good glimpse into the technical aspects, as the steadicam inventor and operator, Garret Brown, is one of the speakers. Vivian Kubrick’s making of documentary is the jewel in the crown though. It’s been included in most releases of the film, and rightfully so as it provides a brilliantly candid look at the production. Vivian was only a teenager so wasn’t imposing on set and due to her dad being the director she could come and go as she pleased. So she caught some wonderful moments, such as Nicholson goofing around in his dressing room as well as a brutally frank interview with Duvall. It’s absolutely required viewing, even if you’re not usually bothered about special features. 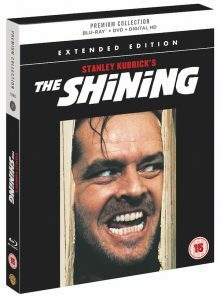 The rest of the extras are decent too, with The Visions of Stanley Kubrick looking at Kubrick’s career as a whole, with particular time spent on The Shining. 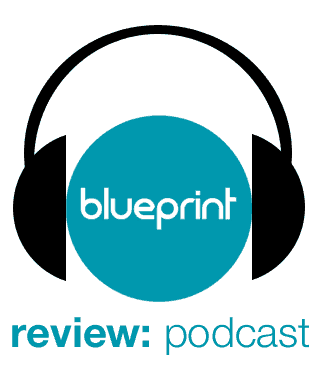 There’s an interview with composer Wendy Carlos and a talking heads doc featuring plenty of big name contributors too which are both worth a look. All in all a brilliant set and a must buy for fans of the film.